The Milwaukee area’s Welsh population generally left their homes in Wales in southwestern Great Britain in the mid-nineteenth century due to the paucity of available land for farming. There is evidence that many people in Wales were aware of the 1841 American preemption laws, which allowed for the purchase of 160 acres for $1.25 per acre. As a result, the Welsh developed their longest-lasting communities in the rural parts of the metropolitan area in the mid-nineteenth century, in particular in Waukesha County. The Welsh also settled in the emerging city of Milwaukee. In 1840, owner Richard G. Owens, along with William Pawlett and John Davis, all from Wales, opened Milwaukee’s first brewery on Huron Street (Clybourn) on the banks of Lake Michigan. Documentary evidence shows that this brewery operated at least through the 1880s, competing with breweries and beer halls founded by Germans and other Milwaukeeans. With his sons, Owens also operated the Atlantic Hotel. The people of Wales in the nineteenth century were fairly sectarian in their religious practices when in their homeland. Four Christian denominations competed for influence: Calvinists, Congregationalists, Baptists, and Wesleyans. However, this sectarianism tended not to extend to Welsh religious practices in the Milwaukee area, as recent arrivals tended to join the Welsh-speaking congregation that was closest to where they settled. Throughout Wisconsin, however, over half of Welsh-speaking churches in the nineteenth century were Calvinist. By 1850 two Welsh-speaking churches had opened in Milwaukee. The Welsh Calvinistic Methodist Church on Michigan Street had eighty official members in this period, with attendance numbers of approximately 200 people. 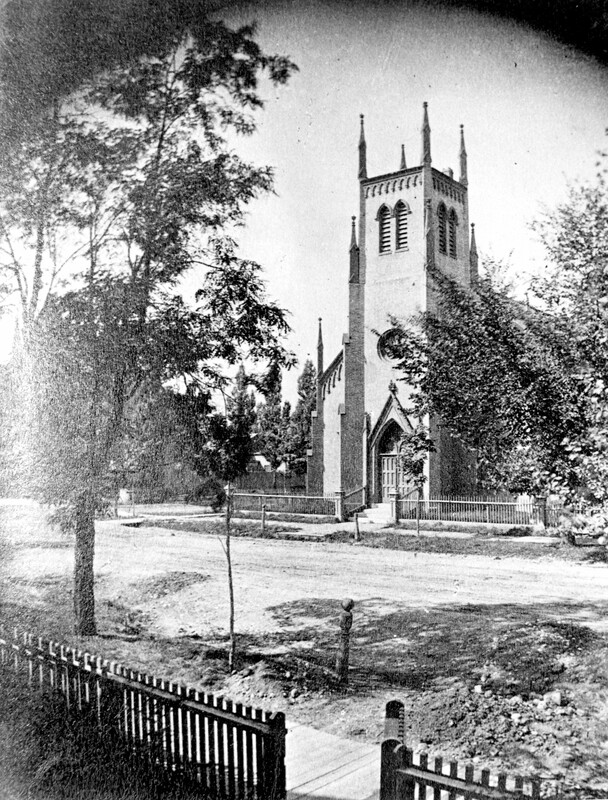 The Congregationalist church on Jefferson Street was slightly smaller with fifty official members and about 150 regular attendees, but it also operated a branch in Bay View. While Milwaukee presented recently arrived Welsh with opportunities to open businesses, the larger proportion of recent arrivals desired to own land in America. Waukesha County became an important place of settlement for many recent arrivals. It was also common for recent Welsh arrivals to purchase farmland that already had been owned and operated. Farmers of Welsh descent contributed to the development of the state’s agricultural sector through their focus on livestock breeding and dairy production. The state’s first Welsh family, the Hughes, arrived in Genesee in 1840 in what became Waukesha County. In 1841, the area’s Welsh population numbered twenty-five, and by 1842, ninety-nine. It was in this area in the western part of Waukesha County that the Town of Wales, currently the Village of Wales, was founded. As in Milwaukee, religion was an important aspect of the lives of Waukesha’s people of Welsh descent. In June 1842, Jerusalem Church, initially Calvinist but after 1920 Presbyterian, was formed in the Town of Wales. By 1845, the Capel Log, or Log Chapel, was built as a place of worship for Jerusalem’s members and operated, until the early 1850s, as the area’s schoolhouse. Jerusalem Presbyterian Church continues to operate in Wales Village, providing a range of social events for its congregants. Religion performed social functions as well. Singing hymns is a widespread cultural practice in Welsh culture, and churches in the Milwaukee area set up their own singing groups which also competed with the choruses of other churches. Known as cymanfaoedd canu (singular gymanfa ganu), these competitions initially allowed for cross-congregation fellowship, worship, and boasting rights. In more recent times, however, cymanfaoedd canu have been more about the celebration of Welsh culture in America than cross-congregational competition. The Welsh National Gymanfa Ganu, organized by the Welsh North American Association, holds yearly meetings for these Welsh-style singing groups across the country. In 1951, 1958, 1970, and 1997, Milwaukee acted as host for these meetings. Other Welsh cultural institutions continue as well. In 1952, the Welsh Women’s Club of the Milwaukee Area was founded. Later dropping its specific focus on women, the Welsh Club of the Milwaukee Area (WCMA) continues to promote Welsh heritage in America and form bonds with other Welsh-interested organizations throughout the country, hosting regular meetings in the southeastern Wisconsin area. Continuing the traditional centrality of singing to the Welsh, the WCMA offers scholarships for young people of Welsh descent to study music in college. The WCMA also operates the Welsh exhibit at the yearly Holiday Folk Fair. ^ Phillips G. Davies, Welsh in Wisconsin, rev. ed. (Madison, WI: Wisconsin Historical Society, 2006), 5-6, 9-10. ^ Davies, Welsh in Wisconsin, 14-15; “Birth of Milwaukee’s Brewing Industry Is Interesting Story,” The Milwaukee Journal, March 19, 1916. ^ Davies, Welsh in Wisconsin, 18. ^ Davies, Welsh in Wisconsin, 15. ^ Davies, Welsh in Wisconsin, 5-6, 9-10, 15; “The Question Box,” Wisconsin Magazine of History 5 (June 1922): 414. ^ Sadie Rowlands Price, “The Welsh of Waukesha County,” Wisconsin Magazine of History 26 (March 1943): 323; “Welsh in Wisconsin,” Wisconsin Historical Society, http://www.wisconsinhistory.org/dictionary/index.asp?action=view&term_id=11084&keyword=welsh+in+Wisconsin, last accessed June 14, 2012, now available at http://content.wisconsinhistory.org/cdm/compoundobject/collection/wmh/id/14183/show/14120/rec/3, last accessed August 1, 2017. ^ Price, “The Welsh of Waukesha County,” 324-325, 327; Davies, Welsh in Wisconsin, 9. ^ Price, 325, 327-328; “Do You Know Your Waukesha Daily Freeman Correspondent?” Waukesha Daily Freeman, March 5, 1954; “History,” Jerusalem Presbyterian Church, http://jpcwales.wordpress.com/history, last accessed June 14, 2012, information now available at http://jpcwales.org/about-us/history/, last accessed August 1, 2017. ^ Davies, Welsh in Wisconsin, 42; Price, “The Welsh of Waukesha County,” 330-331; “Past Venues,” Welsh North American Association, http://www.wngga.org/WNAA2012/PDFs/lists/WNGGAPastVenues.pdf, last accessed June 14, 2012, information now available at http://www.wngga.org/WNAA_NAFOW/wnaa_officers.html#pastven, last accessed August 1, 2017. ^ “Home,” Welsh Club of the Milwaukee Area, accessed May 17, 2017. Davies, Phillips G. Welsh in Wisconsin. Rev. ed. Madison, WI: Wisconsin Historical Society, 2006. Price, Sadie Rowlands. “The Welsh of Waukesha County.” Wisconsin Magazine of History 26 (March 1943): 323-32.